I’ve been hoping to visit Uzbekistan for years. The famous Silk Road cities, full of incredible monuments, were calling my name. But the timing never was right. Fortunately the new and much easier visa procedure made me really motivated and shortly after it was introduced I’ve decided to travel to Uzbekistan. And I loved it! I could have spent only one week in Uzbekistan but I think it was enough to see the biggest highlights and get a glimpse of the country. Of course more time would be better but when working full time my travel time is usually limited and that was the case here as well. While there are many organized tour groups (so many more than I expected) the independent tourism is still at very early stages. There are of course people like me, who prefer to see the country at their own pace. And for those of you I’ve gathered all the useful information that you might need when you visit Uzbekistan and put it together to create some sort of Uzbekistan travel guide. They are all based on my experience from October 2018 so I can only assume with time Uzbekistan will be more and more accessible. Right now I can say nothing but good things about this country and especially its people! I’ve included a few handy links of services and products I personally like and use so you can plan your own trip to Uzbekistan too. They are at the end of the post and those are often affiliate links. This means I will get a small commission if you book / purchase anything though my links, at no extra costs for you. If you like what you are reading and seeing here and would like to support me and my blog please consider using those links. It would be like getting me a virtual drink that you don’t have to pay for! Thanks! Would you like to travel to the Balkans or Central/Eastern Europe? Let me help you with travel planning! Click here for more details! 17 Is it expensive to visit Uzbekistan? Until recently getting a visa to Uzbekistan was the most difficult part of the journey. Not only it was a bit expensive, it was also somehow difficult to get and required a lot of paper work, including obtaining a letter of invitation. Fortunately Uzbekistan is opening up to tourism and changed the rules in July 2018. Now passport holders of 17 countries can travel to Uzbekistan without a visa and 51 more countries (including all from European Union, Australia, Canada or the US) can apply for a e-visa and that’s what I did too. EDIT: On February 2018 a new, visa-free regime, was introduced to citizens of numerous countries, including all European Union. You can see more details here, at the website of Uzbek Ministry of Foreign Affairs. Citizens of the US still need to apply for a visa. To get an e-visa you need to register at this official website. It was a standard form to fill, nothing extraordinary. You also have to attach a picture (I used mine from a visa to Russia) so be prepared for that. Generally just followed the instructions and everything should be fine. You also have to a pay a small fee – $20. I got my visa via email after 2 working days. Before my trip I printed the visa (a standard A4 page) and after arriving at Tashkent airport I gave it to the officer together with my passport. No extra questions were asked, the whole procedure took maybe 2 minutes and I was given back my passport with visa with a big smile and “welcome in Uzbekistan” sentence. It was the same on the way back, minus the smile and welcoming part. The e-visa works also on land border crossings. Few airlines serve Uzbekistan so there are no big issues with getting there. The national airline – Uzbekistan Airways – fly to Tashkent from several European airports, including Paris, London or Rome. There is also Turkish Airlines flying from Istanbul. You can search the best and cheapest connections at SkyScanner (that’s where I found Uzbekistan Airways too). To find the best option set Uzbekistan as your departure country and look for “everywhere” – this will give you the idea of destinations and prices and once you decide on the best route for yourself search for this particular connection. After spending some time in Kazakhstan I flew from Almaty with Uzbekistan Airways (there is also Air Astana serving this route but it was much more expensive on the day I was travelling). I knew next to nothing about Uzbek national airline but since they are allowed to fly in European Union I assumed they are saved to fly with. And everything was fine, the plane was fairly new and the cabin crew was very nice. Even if the flight was only 1 hour and 10 minutes we were served some snack and drinks. On the way back from Tashkent to Almaty it was even better – we had a small delay as apparently the airport in Almaty was closed and as soon as they announced it the flight attendants went through the cabin, offering drinks to everyone – that might be a small thing but definitely not something many of the airlines would think of. I was travelling with carry-on luggage only and this, together with a very early purchase, made this trip so affordable. By the way, Tashkent isn’t the only international airport in Uzbekistan. You can also fly to couple of other places such as Urgench, Bukhara or Samarkand but these airports offer international flights to Russia only. You can also travel to Uzbekistan by land from Kazakhstan, Kyrgyzstan, Tajikistan, Afghanistan and Turkmenistan but obviously I didn’t do it. After arriving at Tashkent airport you still have to get out to the city somehow. And that’s where the hardest part starts as taxi drivers are insane there. Ask your accommodation if they can provide an airport transfer for you, that would make everything so much easier. We didn’t have this arranged, we arrived at midnight so it was a bit stressful to get the transport out of the airport. We managed to pass through the crowd of drivers, walk a bit away from them and then eventually returned to the area where the cars were parked. After a few second we were approached by one driver who was nice enough that agreeing on the price with him and then the ride to the hotel was a very smooth experience. We chose trains as our main way of transport around Uzbekistan and it was a good decision. They were comfortable and reliable. We took the night train from Tashkent to Urgench (15 hours, we traveled in kupe – 4 beds compartment), regular train from Urgench to Bukhara (7 hours, it was the night train all the way to Tashkent, we traveled in platzkarta – an open carriage with beds) and fast trains from Bukhara to Samarkand (1,5 hour) and from Samarkand to Tashkent (2 hours). The last two trains were really comfortable, similar to fast trains in Europe like Thalys, Eurostar, TGV or ICE. The fastest speed I’ve seen on the screen was 240 km/h. You can also travel around by buses or shared taxis but obviously I can say nothing about them. And I can definitely recommend trains. All the trains were full so it’s best to buy the tickets in advance. Apparently they also get cheaper if you buy them early enough. Fortunately you can do it online but there might be some issues with the website so be patient. 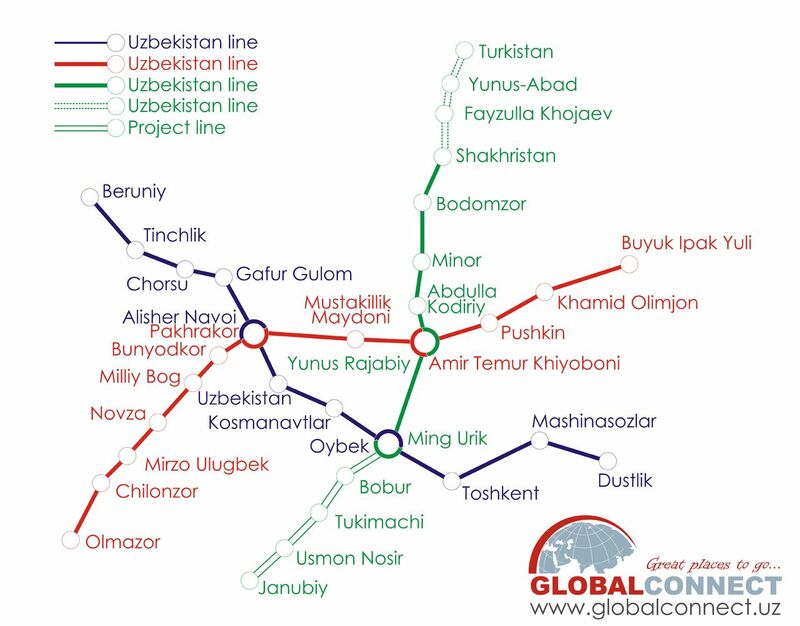 Here is the official website of Uzbek Railways. First you have to create the account and sometimes the confirmation email does not arrive to your mailbox – that’s what happened with me. My friend however had no issues and she bought the tickets for us. It takes time to finish the purchase as the website is rather slow and you need to choose many options (route, train, carriage, seats) before proceeding to the payment. The website is still not fully working in English and some things are written in Russian language. After placing the order you have 8 minutes to finish the purchase, at some point you might get a blank page but don’t close it, eventually you will be taken to the summary. You need to download the pdf files with tickets yourself and print them at home. We got only order forms for trains from Tashkent to Urgench and from Urgench to Bukhara (we had to exchange them for real tickets at the train station) but for the fast trains there were electronic tickets and they were enough to take the train. If you got the order forms you have to exchange them for the regular tickets at the train station. In Tashkent it can be done at the desk no 6. Now the thing with the train stations at ticket offices can be a bit confusing as the tickets are sold at the separate building, not at the station itself. It’s usually next to it, like in Tashkent – it will be on your left side when facing the main building and the ticket offices usually have the word “kassa” written somewhere. Before taking the train it’s best to arrive at the station ahead of time. First, before even entering the building, you need to go through the ticket control where you have to show the ticket and the passport. The next step, at the entrance to the station, is the security control where your luggage will be scanned. Once you’re done with it you have to complete the registration for the train. Somewhere near the security control you should find a desk where the tickets are stamped. You have to show the ticket and the passport again and on the back of the ticket you will receive the stamp. It is especially important before taking the night train as it will be a proof of where you spent that night. Once you’re done with all the controls you are free to board the train. Uzbek taxi drivers are somehow a legend and not in a positive way. Before arriving here some of my friends who have already visited Uzbekistan told me how challenging dealing with the drivers might be so I was prepared for the worst. And well, after few fairly good encounters (at the airport after getting through the crowd, at Urgench train station and Khiva old town) we finally had some issues after arriving to Samarkand. Of course there was a big crowd of hungry drivers waiting for tourists at the exit of the train station, we asked some of them for the price but it was obviously much more than it should have been so we kept walking and ignoring them. After couple minutes we were approached by one more driver who again told us a higher price but he was way too aggressive in his behavior so we passed too and kept walking, hoping that a bit away from the train station we will get a taxi for a acceptable price. But this driver started following us. He was driving next to us and was stopping few times, hoping we won’t figure out it’s him and will approach him again. After five of so attempts he finally gave up but it was enough to scare us a bit, especially that it was already almost dark. We were even considering going inside one of the shops to tell them the guy follows us and we don’t feel safe. Once he was gone we indeed find a taxi for the price we were willing to pay and arrived to our hotel save and sound. Tashkent center – the airport (around 5kms) – 13 000 soms ($1,58). It was Yandex taxi (Eastern version of Uber), ordered for us by the nice guy at the cafe we killed time at. One more thing – the majority of cars in Uzbekistan don’t have seat belts on the back seat (I managed to buckle myself up only once…). Prepare for that. At first I wasn’t very comfortable with it but after a while I got used to it really. Until recently the best way to get Uzbek soms was at the black market but in September 2017 the government regulated the exchange rate and now it is 8 220 soms for 1 US dollar, no matter where you exchange. You can still meet man offering you exchanging money at the markets but to be honest I wouldn’t go with it. I exchanged the money at the hotel in Tashkent, at the official point in Khiva and at the hot dog stand next to the official point in Bukhara. Two of them offered 8200 soms for 1 dollar but I didn’t mind as it was next to nothing when I exchanged 100 USD and I didn’t feel like looking for another exchange place only to get a slightly higher rate. In general US dollars are your default currency to use in Uzbekistan. You can even pay for hotels in dollars (in 3 out of 4 places I did it without any problems). I saw they also exchange Euro and Russian rubles but I would still go with dollars. Be sure the money you want to exchange is clean and crisp and can’t be torn (even tiny little bit, they didn’t accept one bill I had because of that). In Tashkent I saw some ATMs but didn’t use them, in other cities I didn’t see any although I’m sure there must be some. Just in case take with you as much money as you think you’d spend plus a bit extra and don’t rely on the bank card in Uzbekistan. Prepare to carry a lot of money with you. The highest bill you can find here is 50 000 soms (a bit over $6) but you will be mostly using 5 000 and 10 000 bills. Exchanging $100 is worth a bag full of Uzbek soms. While I usually travel solo in Uzbekistan I was accompanied by my friend Ewa. But we’ve seen few women travelling on their own so solo female travel in Uzbekistan is definitely doable. I think I would also feel rather comfortable if I were there alone. People are very respectful and there wasn’t even one situation when we felt something might be wrong only because we are women. As everywhere else use your common sense when travelling in Uzbekistan but I don’t expect you to have any major issues there. Yes. For all the time I felt very safe in Uzbekistan, even more than in many of the places I travel to. I can’t really explain why was it but people were really nice and welcoming, they were curious about us but in a friendly way and had no bad intentions. Besides charging more for a taxi I didn’t feel like they are using us only because we are tourists. There is a lot of police and military present on the streets so that actually made me feel even safer. At first it is a bit disturbing to see so many green uniforms around but you get used to it after a day or two. Just remember not to take any pictures with police and military on them. And obviously don’t do anything stupid. Three main reasons why tourists visit Uzbekistan are Samarkand, Bukhara and Khiva – beautiful old cities located on the Silk Road route. They were the reason why I came to Uzbekistan too. But this is a big country and have much more to offer! Don’t miss the capital Tashkent. It’s an interesting city to visit for a day or two, with vibrant market, some Islamic monuments, numerous green spaces and incredible metro stations (I found them to be more beautiful than Moscow metro!). If you have more time to spend in Uzbekistan you should also consider visiting Nukus, Aral Sea, Fergana Valley or Termez. Uzbekistan, like few other countries (Iran, Turkey etc) charge more from tourists for visiting the monuments. But it’s still very affordable and worth paying for, especially that even if overprices it’s still a fair price. Sometimes you need to pay extra for taking pictures too but there is no general rule about it. I haven’t eaten in a bad restaurant in Uzbekistan. Every place had some really good food and the prices were fair as well, even if I’m aware these were often touristy restaurants and charged more than local eateries. In most of the places you can find the menu in English, often with pictures too so that makes choosing what to eat so much easier. All the restaurants add the tip to the bill, usually between 10 and 15%. I’m a vegetarian and I was expecting Uzbekistan to be a country of meat lovers where I would have issues finding something for myself. I was so wrong. Could be the touristy spots but I managed to find vegetarian options of all the best Uzbek dishes without any problems. There were manti with pumpkin, plov without meat and lagman with vegetables (my favorite, it was so damn good!). And when I couldn’t find a vegetarian version of the main course I just went for a salad (basic tomato + cucumber or some variation with eggplant) and/or the homemade fries and was more than satisfied too. Food in Uzbekistan is really amazing, so fresh and tasty and it was definitely one of the biggest surprises of this trip for me. Tea deserves its own part in this post. Uzbekistan is a heaven for every tea fan! The culture of drinking tea is very much alive there and you can’t escape it really. When ordering a tea you will be served a pot, usually enough for 3-5 cups, of delicious black or green tea. It was really among the best tea I’ve ever had and I’m a huge fan of this drink. Fun fact – tea is never served with sugar so if you add it you need to ask for it and sometimes even pay extra. In one of the restaurants in Bukhara the sugar was twice as expensive as the pot of tea itself! (Well, it was also the cheapest pot I’ve had there, for 1 000 soms / $0,12). Usually you can expect to pay 5 000 – 10 000 soms for the pot but I had the tea as expensive as 20 000 soms (at the Summer Palace in Bukhara). In Tashkent I’ve seen and visited some of the Western style cafes (I haven’t really looked for them in other places). My favorite one was Multi MaFé Pastry and Bakery. Everything is fine until you need to use the toilet outside your hotel. Prepare yourself for some horrific experiences really. Not always it’s that bad but it’s better to expect the worst, even in the decent restaurants and tea houses. In general, except of hotels, you will find mostly squat toilets. The default language to use in Uzbekistan, besides Uzbek of course, is Russian. But don’t worry if you don’t know it as you can get around with English too. After travelling a bit in post Soviet countries I was actually surprised how many people can speak really good English. Of course these were mostly touristic places but they were well prepared for tourism. I was using mostly Russian because I like practicing it but knowing only English wouldn’t be too difficult either. It’s worth knowing at least one word in Uzbek and that’s “rahmat” – “thank you”. It’s an easy word to remember and brought so many smiles when I used it. I learnt it on my first day in Tashkent from friendly girls at the shop. Also, if you don’t know Russian, you should at least how to say the name of your country in that language. Locals are curious and you will be asked countless times each day where you are from. It’s worth to book the accommodation in advance, especially in the season. We’ve heard from the local guides that the number of good and centrally located places to stay is still not big and they are often taken by the tour groups which leaves not enough options for individual tourists. Metro in Tashkent is incredible, one of the most beautiful you will ever see. There are 3 lines, 29 stations and some of them look like museums with incredibly beautiful ornaments around. You pay 1 200 soms for the token (the system used in numerous post-Soviet countries) and you are free to ride and visit the stations. Before entering you might be asked to have your belongings scanned but that’s a standard procedure that doesn’t even take a minute. Until recently it was prohibited to take pictures inside the metro and at the stations but these rules have fortunately been changed and now you can freely take pictures around. Just be careful and avoid having military officers pictured (and there are many of them around). I took lots of pictures in Tashkent metro, some of the train dispatchers were looking at me with a friendly smile, others were just staring curiously but no one bothered me. Most of the stations were beautiful and worth visiting but my favorite ones were Alisher Navoyi, Mustaqillik maydoni, Chilonzor, Kosmonavtlar and Ozbekiston. You can find the map of Tashkent metro here, it’s worth to downloading it to your phone before the trip. Again, I was expecting a terrible internet in Uzbekistan and it wasn’t that bad. The speed was decent enough to download Netflix shows even if it took a while. What surprised me was that in 3 out of 4 hotels I’ve stayed at Facebook was banned and I needed VPN to access it. All the other regular websites and social media platforms were working just fine. Another surprise was that in Khiva and Bukhara as well as some train stations (Urgench for sure) there was a free internet opened and working fine as well. Sometimes it was even faster than the one we had in the hotels. You only had to log in using the code they send to your phone number (Polish number worked fine). I was considering getting a local sim card but eventually didn’t. If you’d like to do that there are plenty of shops by mobile phone providers around. It’s forbidden to take pictures of government buildings and military and it’s really better to avoid those. I’ve read horrific stories where tourists were asked to delete all the pictures from their time in Uzbekistan only because there was a military official barely seen in the corner. To be on the safe side before leaving the country I’ve hidden all the pictures on my computer and went through all those that I had on the memory card to delete all the suspicious ones but at the airport in Tashkent no one asked me to see the pictures and go through my files. It might be different at the land crossing though. I didn’t buy anything, unfortunately, as I was travelling with the carry-on backpack only. But there were so many things I really wanted to get! Beautiful ceramics and hand-made textiles were my top pick but there were lots of others souvenirs that looked nice enough I would consider purchasing them too. If you like beautiful things that can decorate your home Uzbekistan might be a good souvenirs destination for you. I didn’t ask for prices as I was afraid the sellers would convince me to get something but I assume it’s rather affordable. The only thing I didn’t really like about Uzbekistan was the fact that souvenirs stands were literally everywhere. They occupied the main streets, small squares next to monuments or even monuments themselves. You enter a madresa and then you see numerous stands with all the souvenirs that kind of spoil the visit. Is it expensive to visit Uzbekistan? I found Uzbekistan to be a rather affordable country, much cheaper than destinations in Central Europe or the Balkans that I usually go to. We were in Uzbekistan for 7 days and spent $120 per person for food, taxis and entrance fees. We didn’t really look for the cheapest places to eat, we went inside probably every possible monument and in general we didn’t really save money. Besides that we paid (per person) $144,60 for accommodation, $14 for city taxes and $43 for train tickets. Altogether the cost of the 7 day trip to Uzbekistan were $630, including everything (also getting there from Poland and obtaining the visa). I really think that wasn’t so much for such an exceptional destination to visit! All the information above are based on my own experience visiting Uzbekistan in October 2018. If there is anything else you would like to know that I haven’t thought of feel free to ask below in the comments or at the amazing Facebook group I’m a founder of. And don’t wait too long with visiting Uzbekistan as I’m sure this jewel will be discovered by many soon! This is a wonderful guide Kami! I used to live opposite the Uzbekistan Embassy in Berlin. I found them hilarious as they always used to wave through the lush gardens! I can’t wait to visit for myself! Thank you Victoria, that’s so sweet of you! I really hope you will be able to visit Uzbekistan yourself soon, it’s amazing! Ah, you will love it Kris! If there’s anything else you need to know feel free to let me know, I will try to help! Well written, Kami! It is so wonderful to see that Uzbekistan is changing for the better. I visited in October 2012 (imagine! ): there definitely wasn’t free Internet at train stations and my bag was searched every time I entered the Tashkent metro… Forget photography! On the other hand, Uzbekistan seemed a lot less touristy then. I was lucky that Latvia was among only a handful of countries not needing a LOI for the visa then… So much easier now! Thank you :) It’s actually super easy now! I’ve been having my eye on Uzbekistan for years but the complicated visa procedure stopped me from going and now I kind of felt that part of the charm of Uzbekistan travel is gone as I felt it really was touristy. Still not super busy but enough for a comfortable trip without too many challenges of off the path destinations. But this is a great country with great people so they definitely deserve the tourist and money flowing in! Now that’s it’s easier to travel to Uzbekistan, we (4 of us) are looking forward to our trip in Autumn this year. Your insights & updates are really helpful. Thank you so much for sharing your experiences especially the price breakdowns as we planning a our own trip (not joining a tour guide). But we do plan to join a local tour from there. What’s your advice on that? I’m glad the post was useful to you. I only had a local driver-guide in Bukhara, it was arranged through the hotel I stayed at and he took us to sights that were a bit far from the center, in different directions. Other than that I explored everything on my own but if it wouldn’t be difficult to arrange the guide / local tour on spot, best would be to get in touch with the hotel you’re about to stay in. Uzbekistan is great, I’m sure you will enjoy it! Thank you so much for your nice comment, it means a lot to me! Four of us are travelling to Uzbekistan in June (from London). After reading your blog, I am excited and looking forward to visit the country. I wish you would have included information about private, friendly guide. It is the best Uzbek guide. It is extremely helpful. Looking forward for a pleasant Uzbek trip. It’s a wonderful blog post.